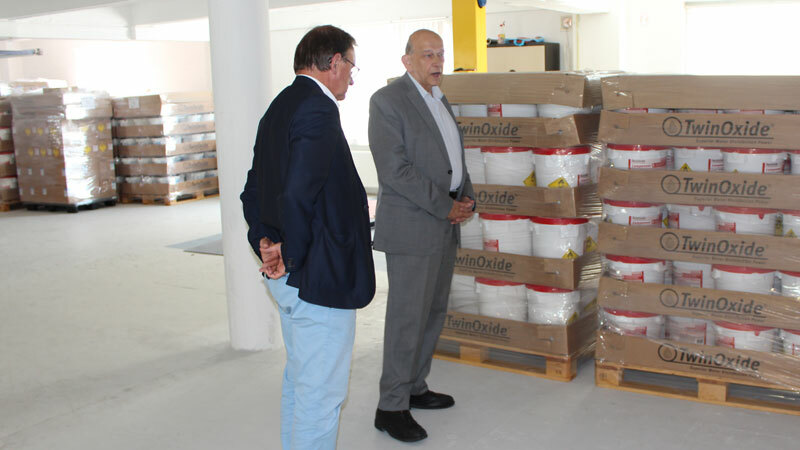 CurTec was invited by TwinOxide® to celebrate the first delivery of the 10-litre Click Packy. CurTec developed the new Click Pack capacity together with TwinOxide®. Henk Pontier presented director/owner Paul van Camp with a cake to celebrate their renewed cooperation. Paul has been a CurTec customer for almost 10 years and uses a range of Packos and Click Packs for packaging water treatment chemicals. These products are supplied worldwide to (local) authorities and companies that specialize in waste water treatment. High-quality packaging with the correct certification is a requirement to protect aggressive chemicals during their, often distant, travels. The chemicals are supplied in a range of quantities, and so there was the need for both small and large containers. 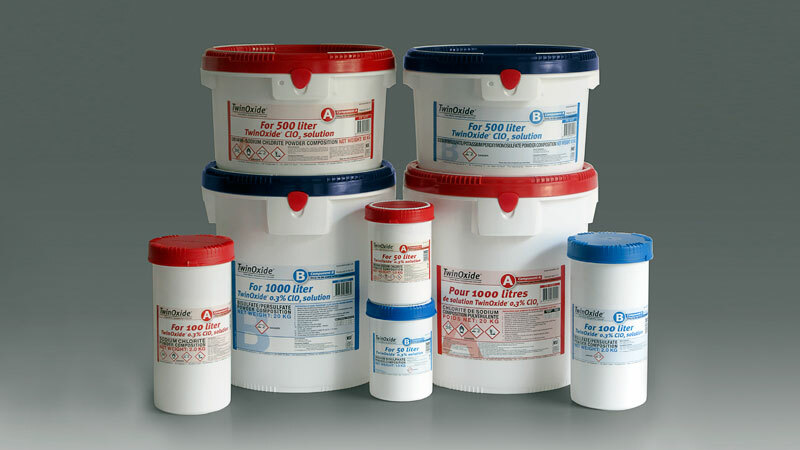 Initially, TwinOxide® opted for tubs, but these, ultimately, did not meet their requirements. The tubs were not guaranteed to be air and watertight, and consequently moisture caused the content to harden. Additionally, the tubs were not sufficiently strong, and could not be stacked high. And so Paul called on CurTec to renew their cooperation and find a better packaging solution. Paul: ‘As we transport all over the world and especially to the USA, Africa and Asia, it is very important that the packaging does not absorb moisture.’ The new packaging needed to be moisture proof, stable and UN certified, and able to hold approximately 10 kilos of product. TwinOxide® had a preference for the Click Pack nestable container, as this met all the requirements. Because the range did not yet include a 10-litre container, CurTec produced one for TwinOxide®. The lids are supplied in a range of colours, because the water treatment chemicals each consist of two components. ‘20 grams of each component can be used to make 1 litre of liquid, and, depending on the quality of the water, up to 30,000 litres of water can be treated’, Paul explains. ‘In African countries people always disinfect their drinking water at the pump, by adding small bags of calcium hypochlorite to their jerrycans. This makes it safe to drink the water, but it is still an enormous chlorine bomb. The water treatment chemicals used by TwinOxide® are revolutionary because, unlike calcium hypochlorite and other reactive products, they do not contain any carcinogens and are not harmful to humans, animals or the environment’, according to Paul. He is rightfully proud of his products and his company. And, also a little proud of the CurTec packaging.